Tabula geographica distributionis linguarum Kartvelianarum. Linguae Kartvelianae (Georgiane ქართველური ენები), etiam Iberianae et olim Caucasicae Meridianae appellatae, sunt familia linguarum ex Caucaso orta et in usu praecipue in Georgia, et inter magnos loquentium nativorum greges in Russia, Irania, Civitatibus Foederatis, Unione Europaea, Israele, et boreorientalibus Turciae regionibus. Sunt 5.2 milliones loquentium linguarum Kartvelianarum per orbem terrarum habitantium. Haec familia linguarum ad aliam familiam linguarum pertinere non scitur, qua re una ex primariis mundi familiis linguarum est. Primus fons litterarum in lingua Kartveliana est inscriptiones Bir el Qutt in lingua Georgiana, Asomtavruli scripto Georgiano antiquo in monasterio Georgiano prope Bethleem perscriptae, quae ab anno 430 supersunt. Scriptum Georgianum est systema scribendi ad omnes linguas Kartvelianas scribendas adhibitum, sed lingua Laz in Turcia etiam scripto Latino scribitur. ↑ Caucasian languages Encyclopædia Britannica. ↑ Commentarius de linguis Kartvelianis in Ethnologue. Boeder, W. 2002. Speech and thought representation in the Kartvelian (South Caucasian) languages. In Reported Discourse: A Meeting-Ground of Different Linguistic Domains, ed. T. Güldemann et M. von Roncador, 3–48. Typological Studies in Language, 52. Amstelodami et Philadelphiae: Benjamins. Boeder, W. 2005. 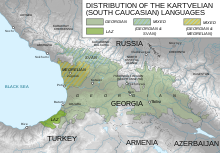 The South Caucasian languages. Lingua 115(1-2):5-89. Dalby, Andrew. 2002 Language in Danger: The Loss of Linguistic Diversity and the Threat to Our Future. Novi Eboraci: Columbia University Press. Delshad, F. 2010. Georgica et Irano-Semitica [Theodisce]. Wiesbaden. Fähnrich, Heinz. 2002. Kartwelische Wortschatzstudien. Ienae: Friedrich-Schiller-Universität. Fähnrich, Heinz, et Z. Sardzhveladze. 2000 Dictionarium Etymologicum Linguarum Kartvelianarum [Georgice]. Tifli. Gamkrelidze, T. 1966. A Typology of Common Kartvelian. Language 42(1):69-83. Gamkrelidze, T., et V. Ivanov. 1995. Indo-European and the Indo-Europeans: A Reconstruction and Historical Analysis of a Proto-Language and a Proto-Culture. 2 vol. Berolini et Novi Eboraci: Mouton de Gruyter. Hewitt, B. G. 1995. Georgian: A Structural Reference Grammar. John Benjamins Publishing. ISBN 978-90-272-3802-3. Kajaia, O. 2001. Dictionarium Megreliano-Georgiano [Georgice]. Vol 1. Tifli. Kartozia, G. 2005. Lingua Laz language et eius locus in systemate linguarum Kartvelianarum [Georgice]. Tifli. Klimov, Georgius. 1964. Dictionarium Etymologicum Linguarum Kartvelianarum [Russice]. Moscuae. Klimov, Georgius. 1994. Einführung in die kaukasische Sprachwissenschaft. Hamburgi: Buske. Klimov, Georgius. 1998. Etymological Dictionary of the Kartvelian Languages. Berolini: Mouton de Gruyter. ISBN 3-11-015658-X. Klimov, Georgius. 1998. Linguae Mundi: Linguae Caucasicae [Russice]. Moscuae: Academia. Laks, Bernard. 2008. Origin and Evolution of Languages: Approaches, Models, Paradigms. Equinox. Ruhlen, Merritt. 1987. A Guide to the World’s Languages, Vol. 1: Classification. Stanfordiae: Stanford University Press. Holmer, Arthur. The Iberian-Caucasian Connection in a Typological Perspective. Kutscher, Silvia. Lazuri Nena: The Language of the Laz. Tuite, Kevin. The rise and fall and revival of the Ibero-Caucasian hypothesis. Novissima mutatio die 26 Martii 2019 hora 20:27 facta.